University colleges. Total Aggregate no of vacancies available in UCMS Recruitment are 75 posts. 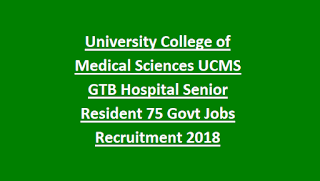 Interested candidates may apply online for UCMS Senior Resident and other jobs using the University College of Medical Sciences official link @http://www.ucms.ac.in. Applicants can attend the walk in interview as per given dates for this UCMS Senior Resident posts. Candidates are required to bring self attested copies of certificates at the time of interview. Interview will be conducted for eligible candidates from 25-09-2018 to 27-09-2018. 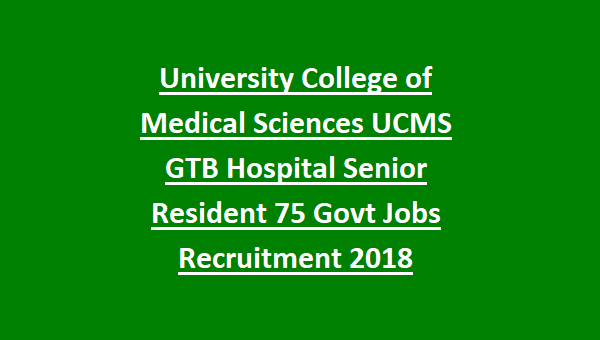 University College of Medical Sciences UCMS Recruitment 2018- Eligible qualifications, age limits, Pay scale, Interview dates, Application procedure are given below. The no of vacancies available in UCMS Recruitment: 75 posts. 1. Senior Resident/ senior Demonstrator: 75 posts. 2. Junior Assistant: 00 posts. Upper Age limit for Sr. Resident post is 33 years as on 25-09-2018. Upper age relaxation for SC/ST candidates is 05 years and for OBC non creamy layer is 03 years. Selected candidates will be paid based on their qualification. Applicant must have qualified post graduation degree (MD/ MS/ DNB) or MBBS in concerned discipline or M.Sc (medical) in Anatomy physiology, Biochemistry, Pharmacology, microbiology from a recognized medical council of India. Selection for Sr. Resident/ Sr. Demonstrator, Junior Assistant Jobs in UCMS Recruitment will be based on candidate performance in Interview, which will be conducted in last week of September 2018. Candidates are required to carry self attested photo copies of qualification and other certificates at the time of interview. Results will be updated on UCMS web portal in the first week of October 2018. Candidates are advised to attend the walk in interview for Sr. Resident, Junior assistant vacancies from 25-09-2018 to 27-09-2018.UCMS official web portal is @ http://www.ucms.ac.in.